Email Matt by typing your message in the box below and hitting "Send." Matt grew up with an Apple keyboard in hand. He started on an Apple IIe and later started developing games in HyperCard on his Mac. Through college Matt developed games for the Gameboy Advance, always interested in working on mobile systems. After working in marketing for a number of years, Matt bought his first iPhone and started learning Objective C. He created a few of his own apps, eventually developing games for iPhone/iPad. 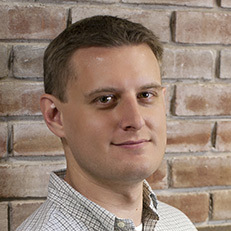 Leveraging his interest in mobile development, Matt made the career switch to app development. In 2009 Matt started at RB. He has been working with clients ever since developing first class iPhone and iPad apps. At RB Matt is involved in the complete product life cycle, helping clients flesh out UI/UX, building wireframes and prototyping, development and QA, and after launch support. He is experienced developing apps for multiple devices and OS versions. Matt is always interested in learning new mobile technologies, experimenting with PhoneGap, Cocos2d, Unity, etc. He also has a decent foundation in Photoshop, but is always asking the graphic design team questions.